Super Why! is a clever 3-D animated series that focuses on fundamental reading skills. It’s perfect for kids between 3- and 6-years-old, and a great way to smuggle some learning into T.V. time — deceptively intelligent! This particular Super Why! 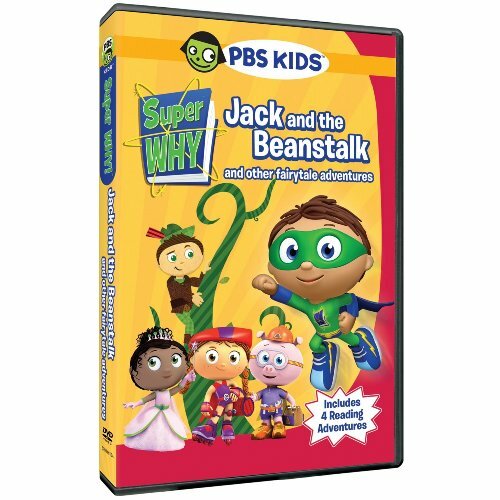 DVD is a collection of four different well known fairy tales: Jack and the Beanstalk, the Princess and the Pea, Little Red Riding Hood, and theThree Little Pigs. Children that are already familiar with the traditional tales will enjoy using literacy skills to solve the adventurous mysteries that each Super Why! episode brings. And for those that will be introduced to the classic tales for the first time, it’s the perfect induction. The “Super Readers” (alter egos of the leading characters: Whyatt Beanstalk, Jack’s younger brother; Red, from Little Red Riding Hood; Pig, from the Three Little Pigs; and Princess, from The Princess and the Pea) teach the viewers that by reading words you can control the story. This means that the “Big Bad Wolf” can become the “Small Good Wolf”.